Saturday morning shepherded in a classic Northern California autumn weekend – chilly, but dry. Opening my eyes to the early morning darkness, I wanted nothing more than to remain in the warmth of my bed. It’s been a bit of a busy and stressful few weeks, enough so that I knew that the tension and strain were affecting my perspective on life. As I lay in bed I thought about how I had earned at least a few more hours of sack time. But on this morning I had committed to joining friends to cycle to the top of Mt. Hamilton. The San Francisco Bay Area has two geologic bookends -Mt. Tamaplais (2,572 feet) to the north and Mt. Hamilton (3,848 ft.) to the south. On weekends, hundreds of cyclists flock to the South Bay to enjoy the more than 18 mile climb to the summit of Mt. Hamilton. Personally, I am not one of those cyclists who looks forward to a climb. I’m not built for climbing – my body size and type are more akin to a Clydesdale rather than the gazelle-like serious road riders you see out there. For me, riding up Mt. Hamilton is a seemingly interminable grind. Yet, I always enjoy it. Part of the reason is the setting. Pedaling up the road in the early light, I looked across the expanse of Santa Clara Valley and to the fog receding over the Santa Cruz mountains to the west. To the north, Silicon Valley and a portion of San Francisco – now better known as the home of Bat Kid – came into view. Leaves from Valley oaks blanketed the roadway, and Northern California natives like Toyon, Cotoneaster and Madrone lined our route. Occasionally, we would catch a breath of wild Sage, see the last of summer’s Indian paintbrush or hear the raucous laughter of acorn woodpeckers. And, as we neared the summit, our destination, the Lick Observatory gradually came into view. Eighteen miles is a long climb on a bicycle. But, thanks to Mr. Lick it’s manageable even for a Clydesdale like me. During the California gold rush, Lick, a carpenter by trade, began buying property in the little known town of San Francisco eventually becoming one of the richest people in the state. Lick was also an amateur astronomer and prior to his death in 1876 he agreed to use his wealth to fund an observatory atop Mt. 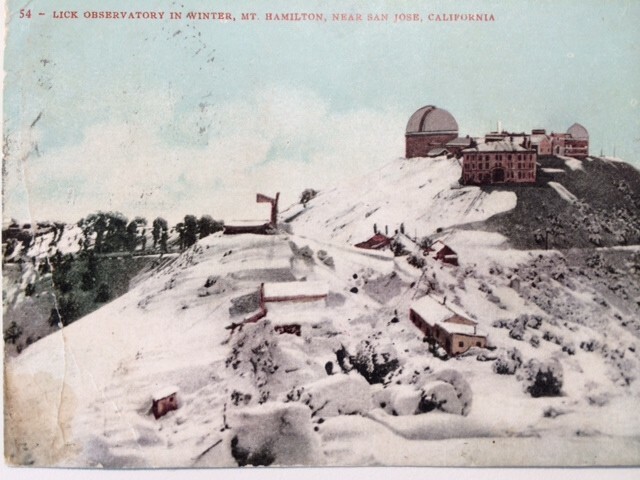 Hamilton – what is now known as the Lick Observatory. As a condition of funding the observatory, Lick was able to get the local government to build a road to the top of the observatory – the road I was now riding. Fortunately for me and my fellow cyclists, construction of the road occurred in the 1880s predating motorized vehicles like bulldozers and backhoes. Instead, human labor, along with horse and mule teams were used. Because of this, the climb never exceeds a 6.5% grade. Mr. Lick was interred in the observatory under its large refracting telescope. Whenever I reach the summit I give silent thanks to him for building the observatory when he did. And, then, I turn around and trade altitude for a change in my attitude as I enjoy the descent home and feel the stress fall behind me.